The United Nations will meet for two weeks in September in New York, gathering governments from all over the world to debate issues of global importance. The threat of resistant bacteria will be the only topic on the agenda of an all-day “high-level meeting” taking place September 21st. To put that into context, this will only be the fourth time the General Assembly of the United Nations has addressed a health issue. Others have included topics such as HIV and Ebola. When you look at the topic of antibiotic resistance and the role of livestock antibiotic use, there have been various paths explored across the globe. In response to consumer concerns, the Western Europeans focused on the goal of “reducing” antibiotic use in livestock. However, there is no science that supports a link between antibiotic-use in livestock with antibiotic resistant bacterial infections in humans. Is simply reducing use in livestock the answer? Does it benefit human health, animal welfare, or our society? The United States on the other hand has decided to take a more precautionary approach, beginning with regulatory changes to the Veterinary Feed Directive (VFD and over the counter water medication. The regulatory changes will discontinue the sub-therapeutic (growth promotion) use of medically important antibiotics and increase veterinary direction of therapeutic uses of medically important antibiotics. This change goes into effect January 1st, 2017. While many producers and veterinarians have been focused on these upcoming changes, we need to be visionary on “what’s next.” The topic and concern of antibiotic resistance is not going away after Jan 1. How do we as an industry work together on combating antibiotic resistance? Just as in human medicine, antibiotics play an important role in animal care and treatment of sick animals. In order to protect the efficacy of antibiotics for future generations of both humans and animals, we need to become Antibiotic Stewards. In order to be antibiotic stewards, we need to understand our antibiotic use. We have used tracking and benchmarking in many other areas of swine production to improve, and antibiotic use is no different. This includes tracking grams of antibiotics used per head, as well as benchmarking ourselves against other producers. One tool that will give producers access to this information is PART or Pipestone Antibiotic Resistance Tracker from Pipestone Veterinary Services. PART focuses on giving producers the tools to Record, Review, and Respond for the Responsible Use of Antibiotics. We can’t skip to “Respond” before taking the time to “Record”, and “Review” antibiotic use and resistance patterns. As the United States (and the United Nations) consider how to combat antibiotic resistance, it is important we make decisions on facts rather than fear. What facts are we providing as an industry? What are we doing to become better at Antibiotic Stewardship than ever before? 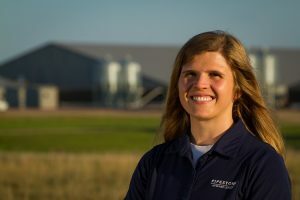 Dr. Carissa Odland graduated from the University of Minnesota’s College of Veterinary Medicine and joined Pipestone Veterinary Services and Pipestone System in 2009. She serves as Pipestone’s Director of Animal Welfare.